Stocks can be active if news derived from earnings reports is released during this time. New traders should not trade during pre-market hours. There are not enough players to show a clear trend. Spreads are wide and liquidity is very low. It is quite likely you will not be able to get out of a position within your stop-loss. If a new trader really believes the stock is going to move in his favoured direction and he does not want to chase the stock, he can take a very small position - 10 to 30 percent of his normal share size. This lowers the risk of a large loss. • Very dangerous if you get in a position in the wrong direction because the market can move quickly. • What looks like momentum can quickly reverse and it often does so. • When stocks gap more than 13 percent, it is more difficult to predict their morning direction. • TRIN readings are often choppy with large candles in the chart, showing uncertainty of the trend. • A stock's price can break your stop-loss quickly, and you may find yourself chasing the stock's price to get out, resulting in a larger loss. • You must be fast with hotkeys and have advanced order-routing skills. Trading with a mouse can cost you money on entry and exit of your position. 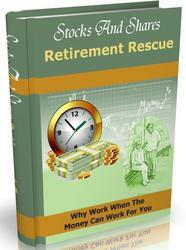 • You can make huge profits quickly, if you get in and ride the momentum. The stock's price may never be against you from your point of entry. • Scalpers enjoy "gifts" that include getting filled below the bid or above the ask and being able to immediately close their position for an instant profit, which are due to the great liquidity of the market. 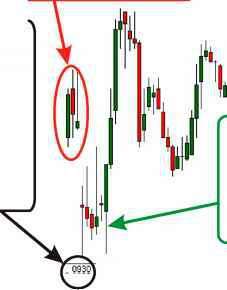 You must wait until the two-minute bar is complete and the next bar starts to form before starting to trade. This strategy assumes that if the high or low of this first two-minute bar is broken, the stock will continue in that direction. Buy immediately when the next candle crosses above the two-minute high of the first bar after the morning open. Trading above the two-minute high is a sign of strength. The two-minute low is now your stop-loss. Sell your position immediately if the stock trades below this line. If this line is broken, the stock is showing weakness and you do not want to be long with a weak stock. Sell here when the stock trades below the low of the PSC™. Once you are in position and the stock does not take out your stop-loss, you must decide where to sell to take profits. You can do this by selling the Confirmation Method™, when the candle after a power shift candle breaks the low of the PSC™, confirming weakness in the stock. The two-minute high is now your stop-loss. Cover your position immediately if the stock trades above this line. If the stock's price crosses above this line, the stock is showing strength, and you do not want to be short with a strong stock. Sell short immediately when the next candle breaks below the two-minute low of the first bar after the morning's open. If the stock's price trades below the two-minute low, it is a sign of weakness. 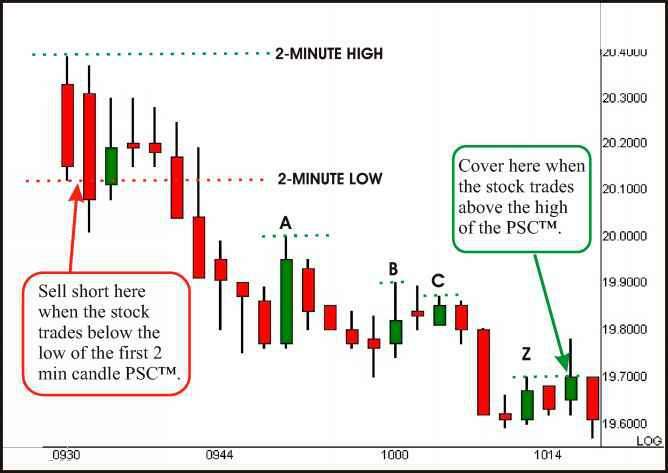 Cover here when the stock trades above the high of the PSC™. Once you are in position and the stock does not take out your stop-loss, you must decide where to cover and take profits. You can do this by using the Confirmation Method™, when the candle after a power shift candle breaks the high of the PSC™, confirming strength in the stock. It is still a valid buy when the candle breaks above the two-minute high. The two-minute bar rule is still valid even if the next bar does not break above or below the two-minute high or low. You can wait for up to eight candles to form after the first two-minute bar. If the stock has not broken any line by then, the two-minute bar rule is no longer valid. Now that you know the two-minute bar rules, go to the next page to see what it is like in real life. Note that there is a five-minute rule that works exactly the same as the two-minute rule. 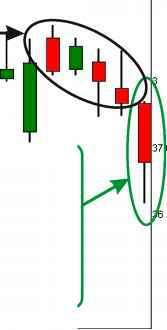 Instead of using two-minute candlestick charts, you use five-minute candlestick charts. Note points A, B, and C. These are all power shift candles. The reason the stock was not covered at these locations is because the following candle did not break the high of the PSC™ . Note point Z. Point Z is a PSC™. Its high was taken out by the second bar after its formation. The position should be covered immediately when the high of the PSC™ is taken out. The market opens at 9:30 a.m. A flood of market orders comes in and specialists and market makers are able to see these orders, which gives them an advantage over the day trader. They will try to fake the real direction of the stock using all their capital to wiggle you out of your position. They do their best to make the situation appear different from what it actually is. The market maker is trying his best to wiggle out all the longs who bought the day before, by gapping the stock lower at the open. If that isn't enough to scare the longs, he makes three red candles, all with lower closing prices to scare the longs even more. The market opens and the market maker does his best to drive the stock lower at the open to scare the bulls from going long. The market is very fast in the morning and reversals are common around 9:35 to 10:05 a.m. Here is an example of a 9:45 reversal. Here is a nice opening without any gaps. 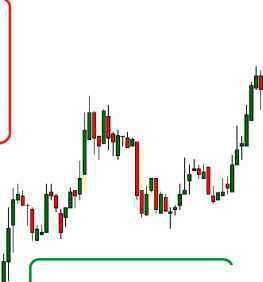 A five-minute morning bar sell set-up is valid because there are no huge gaps. All four days in this group of candles have significant gaps. Note the smaller intraday range. 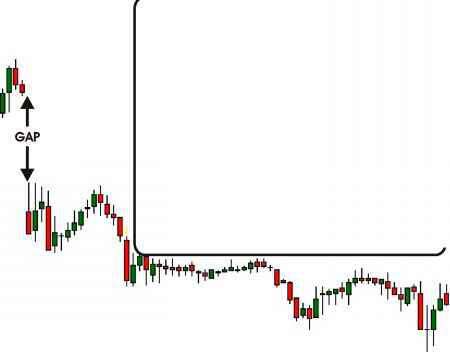 Here is the entire day of the intraday chart plotted in one candle. This is a nice intraday range because there were no gaps at the opening of the bar. 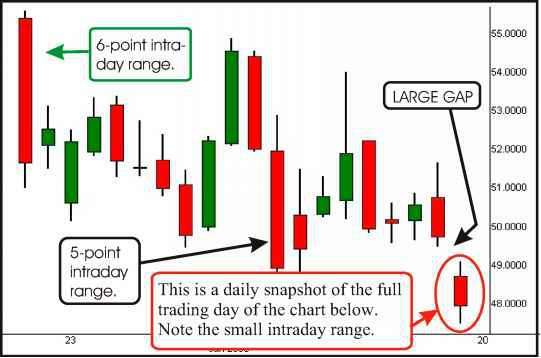 Big gaps make it difficult to acquire larger gains when intraday trading. You would need to be short with this stock overnight to include gains from the gap. Stocks with large gaps tend to have smaller intraday movement. The intraday range for this stock is only about 1.50, from $48.50 to $49. It normally has an intraday movement of more than three points. Trading stocks with big gaps decreases the odds of reaping large intraday profits. The first reversals can take place anytime between 9:35 and 10:05 a.m. The most common reversals occur between 9:45 and 10:00 a.m. 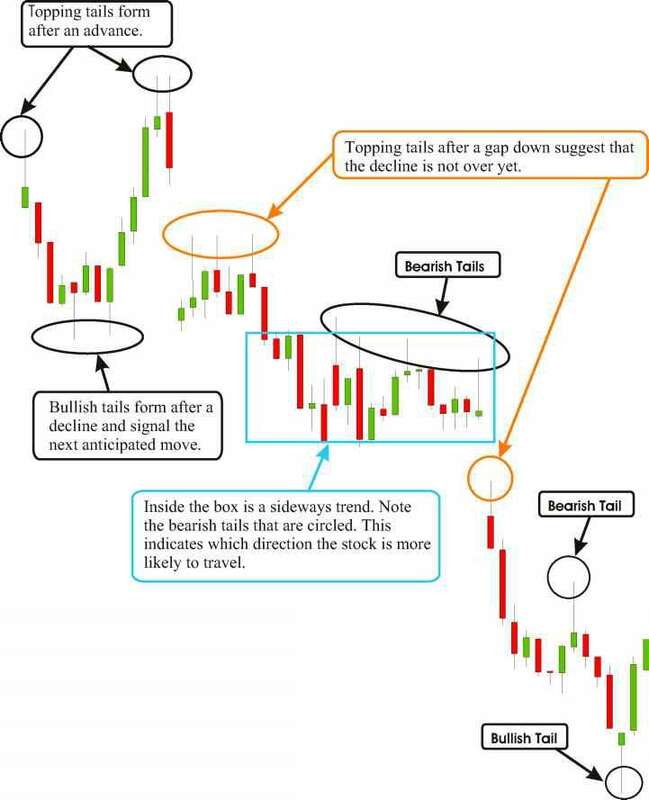 Most reversals happen when the market appears very strong in the direction it is trading. Traders "feel wrong" about trading the reversal because they are fighting against what seems to be the current trend.